The Temple of Vesta (Latin Aedes Vestae, Italian Tempio di Vesta) is an ancient edifice in Rome, Italy, located in the Roman Forum near the Regia and the House of the Vestal Virgins. The temple's most recognizable feature is its circular footprint. Since the worship of Vesta began in private homes, the architecture seems to be a reminder of its history. The extant temple used Greek architecture with Corinthian columns, marble, and a central cella. The remaining structure indicates that there were twenty Corinthian columns built on a podium fifteen meters in diameter. The roof probably had a vent at the apex to allow smoke release. Although there was a fire in the temple, it did not pose a great risk to burning down since the fire was maintained in a hearth and watched closely by the Vestals. Rather, the city of Rome itself was often the source of conflagration that destroyed the temple. The Temple of Vesta did burn twice in written history. In 64 CE, the Great Fire of Rome burned most of Rome, including the Temple of Vesta. It was said by Cassius Dio to have been started by the infamous Nero, but according to Tacitus, Nero was at Antium at the time of the fire. After a fire in 191, Julia Domna, the wife of Septimius Severus, had the temple restored. The sacred flame was put out in 394 by Theodosius I after he won the Battle of the Frigidus, defeating Eugenius and Arbogast. 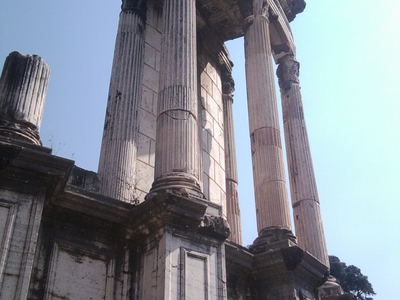 The Temple of Vesta remained reasonably intact until the Renaissance. However, in 1549 the building was completely demolished and its marble reused in churches and papal palaces. The section standing today was reconstructed in the 1930s during the dictatorship of Benito Mussolini. Here's the our members favorite photos of "Ruins in Rome". 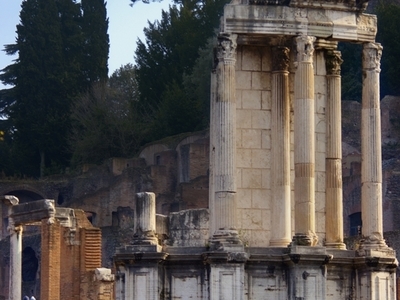 Upload your photo of Temple of Vesta!